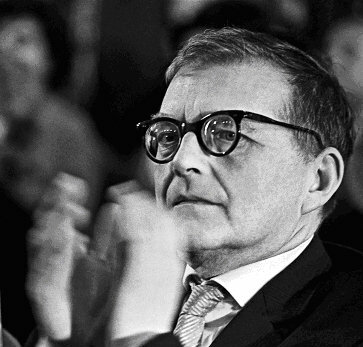 Dmitri Shostakovich was born in St Petersburg on the 25th September 1906. From his earliest years his prodigious musical talent was recognised. He entered the Leningrad Conservatory at the age of 13 and completed his studies at the age of 19. His graduation piece was his first symphony, and its immediate success established him in the forefront of Soviet composers. It proved to be an uncomfortable position since his originality put him at odds with the authorities. Outwardly they wanted Russian art to glorify the moral and social values of the revolution. Inwardly they were afraid of any intellectuals whose ideas might challenge their right to power. Joseph Stalin seemed to have a particular fascination for the work of Shostakovich, and even telephoned him from time to time, no doubt causing considerable anxiety to the composer. Little tolerance was afforded to dissident intellectuals of the time; arrest and transportation to the labour camps was a regular occurrence. The conflict between Shostakovich and the authorities came close to crisis with the composition of his brilliant fourth symphony. In 1935 the newspaper Pravda wrote an attack of Shostakovich describing his work as “muddle instead of music”. Despite this he pressed on with the composition completing the work in 1936. The premiere was set to take place on the 30th December 1936 in Leningrad, however Shostakovich withdrew the work during rehearsals claiming that he was not satisfied with the finale. The finale was not revised, and the real reason for the withdrawal of the symphony was never revealed. Perhaps Shostakovich was becoming aware of the impending “great terror” that Stalin was to inflict on his opponents. The fourth symphony was not performed until 1961. It was against this background that he composed many of his most enduring masterpieces including the fifth symphony (1937), which bore the ironic subtitle “A true Soviet’s reply to just criticism”, and the second jazz suite (1938). Despite its title, the suite is not particularly based on jazz idioms. It is written in the popular light orchestra style of the thirties. The second waltz was an immediate success and has remained one of his most enduring and popular short compositions. It is in ternary form (ABA). The outer sections are based on a minor mode tune of a particularly haunting beauty, which is passed around the players and punctuated with a humorous toy soldier march. Shostakovich’s last years were dogged by poor health. In 1965, he was diagnosed with polio. In 1970 and 1971 he suffered heart attacks that further impacted his health and his mental concentration. He also suffered from a series of broken limbs after falling. Despite these problems he continued working and completing his 14th and 15th symphonies. He died in Moscow of lung cancer on August 9, 1975. The second waltz from the second dance suite was performed by winds of the Portobello orchestra on the 15th December 2007. The conductor was Anthony Weeden.